As a metal fabrication artist, I am happy to take on work from and with designers from simple concepts to scale drawings. Fabrications can be worked from scale drawings laid out as patterns and made as exact duplicates or as Designers: your time and creative flair can guide my talents to your project’s completion.Whether decoration, sculpture, or purpose-orientated metal work, I will take on and complete projects to clients’ demands personally, and if necessary, utilize a specialized team of craftsmen. With an in-house range of equipment, from casting ingots and forging sheet, to working bars of solid stock or turning pieces in the machine shop, to custom mechanical components, pieces are created to perform the intended final use. My intention is to make legacy projects that stand up to test of time in use and performance. Each piece is made with thoughts of the integrity of the metal to respect it as a commodity in limited supply. Click on any thumbnail image to see a larger version above. You may also click on any large image to start a slideshow. Hovering your mouse over the images will pause the animation. 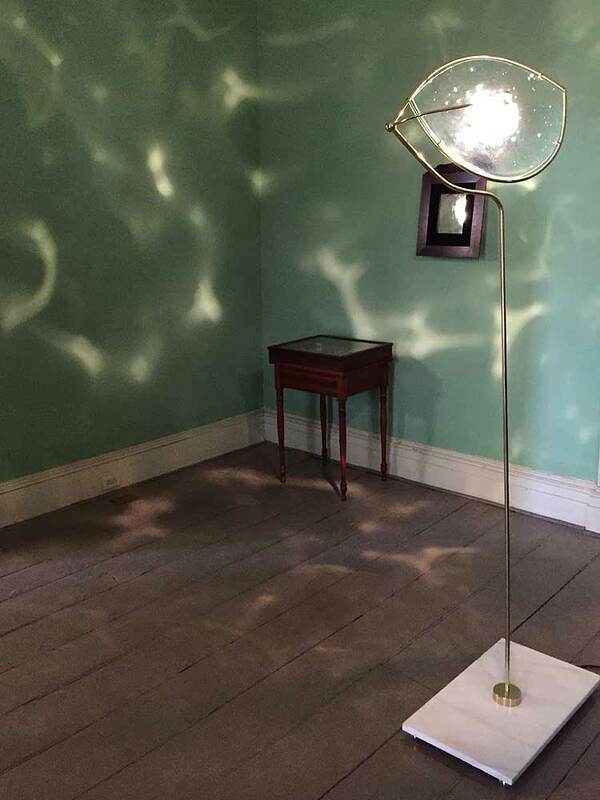 Monocle Floor Lamp: This glass lense with fused Herkimer Diamonds was brought to me with the request to build a holder and light. Through discussions with the artist, Kara Hamilton, we ended up with this monocle type design called Heavy Fixture. The lense is lit from behind with an led light which is mounted to a piece of aluminium that has radial fins to keep the electronics thin. 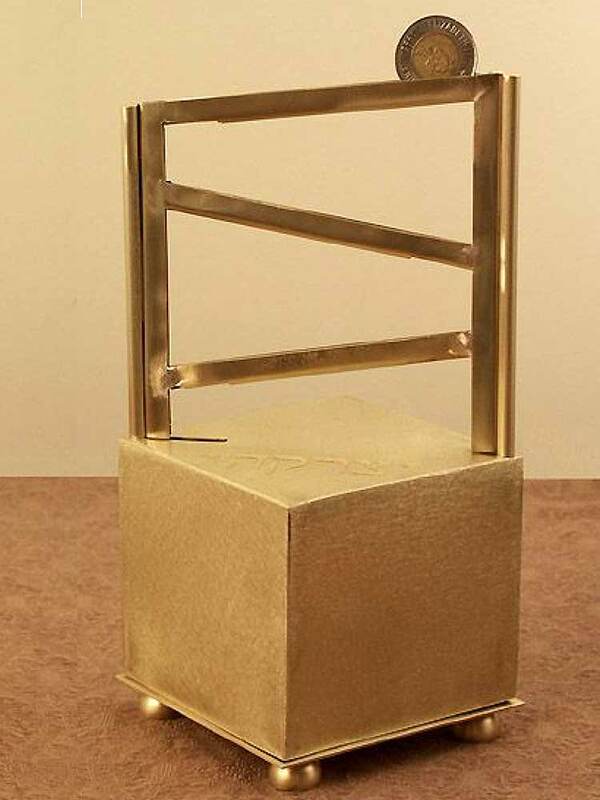 Finished in polished brass with a dimmer mounted on the bottom of the marble base. 5 feet tall. 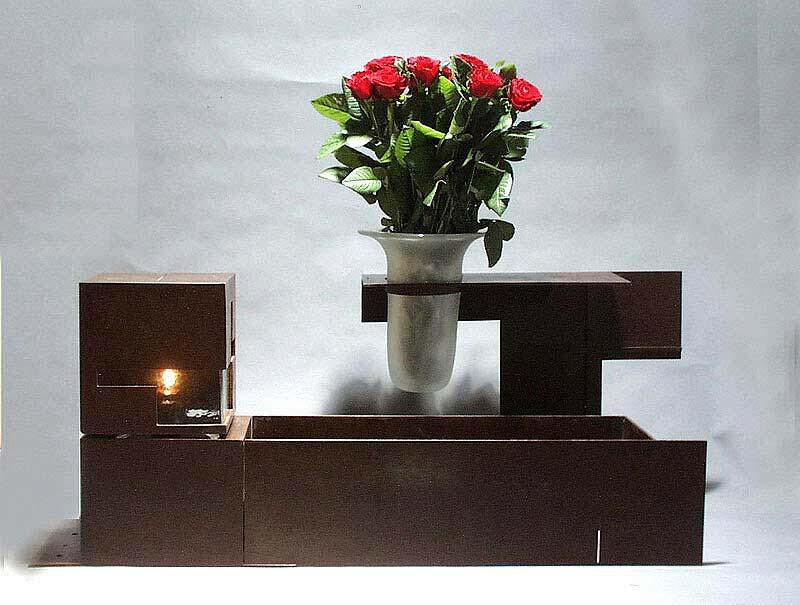 Memorial Flame, Planter, Vase holder and Gravesite Surround: This piece was designed by architect Rajko Jakovic for a memorial gravesite garden. Glass vase design and fabrication Jeff Goodman Studio . The pieces are made from 1/4” thick bronze silver soldered, chemical patina and waxed to withstand the elements.